Charge/Cost = Uses indicates how many uses on average you can get before needing to recharge the weapon (or wait for it to charge on its own). Note that the Cost varies depending on your Enchant skill, so your results may vary. 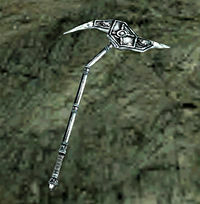 The Ancient Nordic Pick Axe is obtained during the quest Discovery in the Mine and is necessary to harvest Raw Stalhrim. Found on a table in a tower in Raven Rock during The Assassin quest. You get this from Apronia Alfena during the Supply Route Problems quest (or from her body if she dies earlier, e.g. during the Missing Supply Ship quest). Given to you as a reward for The Moon Sugar Mystery quest by Severia Gratius. Lying on the ground in Frykte. Lying on the top of the Altar of Thrond during the Rite of the Wolf Giver quest. Not found in the game, but presumably intended for Grandfather Frost. Note that it is not actually red, but rather yellow, just like the standard Colovian Fur Helm. Held by Uncle Sweetshare (and Grandfather Frost) and required for The Moon Sugar Mystery. Interesting amulet if you are not bothered by diseases (or are already immune to Common Disease) and have plenty of fatigue. Found in Hrothmund's Barrow as part of The Patchwork Airship quest. Held by Erna the Quiet and required for the A Woman Scorned quest. Found on the corpse of the Spirit Bear during The Ristaag. Look for her in Kolbjorn Barrow during The Sad Seer quest. Handed over by either Saenus Lusius or Gaea Artoria as part of The Disappearance of Captain Carius. Neither version is found in the game. The skull in Thirsk's Mead Hall is an activator that disappears after the attack by the Udyrfrykte. It seems the second version of the skull was supposed to appear on the floor at that point but the necessary references are not present. Found on a Riekling surrounded by five Spriggans during The Ritual of Trees. Acquired during The Totem of Claw and Fang quest. Found in Stahlman's Gorge during The Ritual of Water. This page was last modified on 2 June 2017, at 04:51.